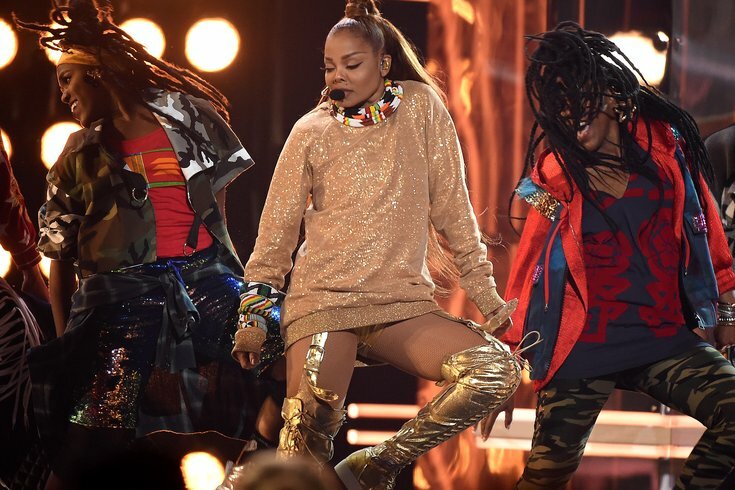 Janet Jackson performs on the 2018 Billboard Music Awards before accepting the Icon Award. The 2018 Billboard Music Awards kicked off Sunday night with unlikely host Kelly Clarkson, who was the first to admit she was a surprising choice for the job. Then, mostly contradicting herself, she launched into a ceremony that was both emotional and entertaining. Miss the show? Check out these eight must-see moments from the ceremony. Speaking of Taylor Swift, this was her first award show appearance in about two years – since 2016’s BMI Pop Awards. Swift was one of the top nominees of the night and took home the award for Best Female Artist and Top Selling Album for “Reputation.” Check her acceptance speeches below. Swift’s win comes just as she kicks off her world tour, which stops in Philly for two nights this July. K-Pop boyband BTS has amassed a following of love-struck fans not unlike what the world has seen with New Kids on the Block, Backstreet Boys, N’Sync, and One Direction. The newest iteration of boyband mania took home this year’s Social Artist award and performed their new single “Fake Love,” becoming the first Korean act to ever perform at the award show. Janet Jackson has been making music longer than most of the night's nominees have been alive, but it somehow took the Billboard Music Awards 30+ years to give her the Icon Award. Jackson is the first black woman to ever receive the honor. In accepting the distinction, she gave special attention to the #MeToo movement and performed a fire set. Khalid and Shawn Mendes paid special tribute to the country’s growing list of shooting victims, singing alongside members of Marjory Stoneman Douglas High School’s student choir. Together they sang Mendes’ “Youth” and honored the 10 victims of Friday’s shooting in Santa Fe, Texas. It’s been 30 years since Salt-N-Pepa became the first female rap artists to hit the Top 40 on the Billboard Hot 100, a moment that paved the way for artists like Cardi B and Nicki Minaj, who are all over today’s Top 40. To commemorate the anniversary, Salt-N-Pepa reunited onstage, along with En Vogue, for a hit-heavy medley and a surprise visit from Kelly Clarkson. The Chainsmokers, who will be performing in Atlantic City this summer, won for best Dance/Electronic Song and Electronic Artist. The group also went on stage alongside Halsey to honor Avicii on the one-month anniversary of the EDM star’s death, bringing special attention to the artist and mental health. Winning five awards Sunday night was Luis Fonsi, whose “Despacito” won him the award for Hot 100 Song, Top Selling Artist, Latin Song, and others. During his acceptance speech, he gave a shout out to his fellow Latinos and honored immigrants. Check out his performance below.